Ҳаҷми пешнамоиши PNG барои файли кунунии SVG: 800 × 533 пиксел. Дигар кайфиятҳо: 320 × 213 пиксел | 640 × 427 пиксел | 1,024 × 683 пиксел | 1,280 × 853 пиксел | 900 × 600 пиксел. Сана 27 September 2005 / 9 August 2008, based on the above flag law dated 25 Avril 1963. Манбаъ SVG implementation of the 63-145 Algerian law "on Characteristics of the Algerian national emblem"
Муаллиф This graphic was originaly Vectorization: User:SKopp. This Algerian photograph or work of applied art, which was published prior to 1969, is currently in the public domain in Algeria because its 50-year term of protection has expired pursuant to the provisions of Article 59 of Ordinance No. 03-05 of 19 July 2003, which was approved by Law No. 03-17 of 4 November 2003 (details). In order to be hosted on Commons, all works must be in the public domain in the United States as well as in their source country. 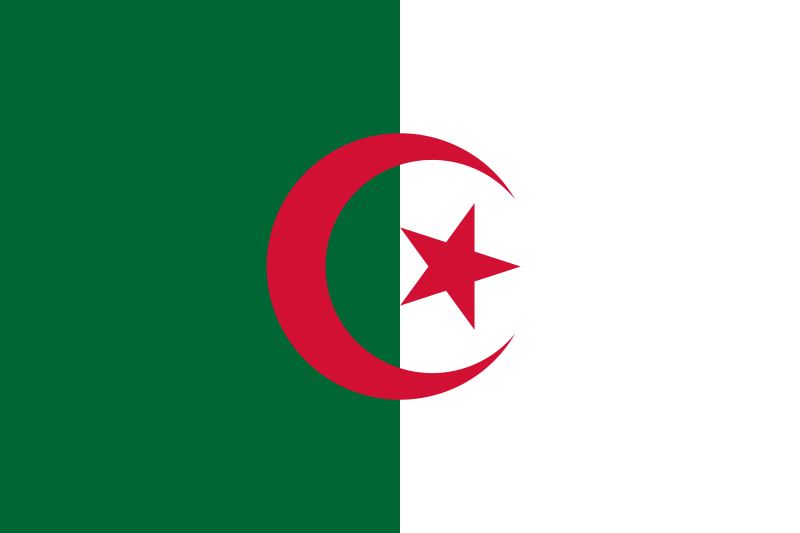 The copyright of all Algerian photographs and works of applied art published prior to 1948 had expired in Algeria on the date of restoration (April 19, 1998) pursuant to the provisions of Article 60 of the defunct Ordinance No. 97-10 of 6 March 1997 which was in effect at the time. Such works are thus currently in the public domain in the United States. нусхаи феълӣ 22:14, 9 марти 2019 900 × 600 (260 байт) AndreyKva Optimized. Ин парванда иттилооти иловагиро дар бар мегирад, эҳтимол аз аксбардораки рақамӣ ё сканер дар вақти сохтан ва рақамӣ кардан, илова шуда. Агар парванда аз вазъияти ибтидоиаш тағйир дода бошад, мумкин аст, шарҳу тафсилоти мавҷуди иттилооти аксро тамоман бозтоб надиҳад.